I have needed GALLONS of coffee lately….. I am finishing out the last few weeks of tax season answering software tech calls, and I am freakin’ EXHAUSTED! 10 April 2016 – Signs about coffee promise a lot, have you noticed? Whether on a sign inside the café, or on the sidewalk sandwich board outside its front door. Sometimes, though, there is no promise — just a warning about the dangers that await you, should you be foolish enough to ignore the coffee option. This one spotted & photographed by my great friend & fellow WordPress blogger, Rio (Seriously Clowning Around). We’d just gone through the Outsider show at the AGO, by the time I’d reached home she had emailed me this discovery just opposite OCAD, down the street from the AGO. “Use it,” she said, bless her generous heart. So I am. It also made me riffle through some photos, to see what other coffee-related signs had amused me. 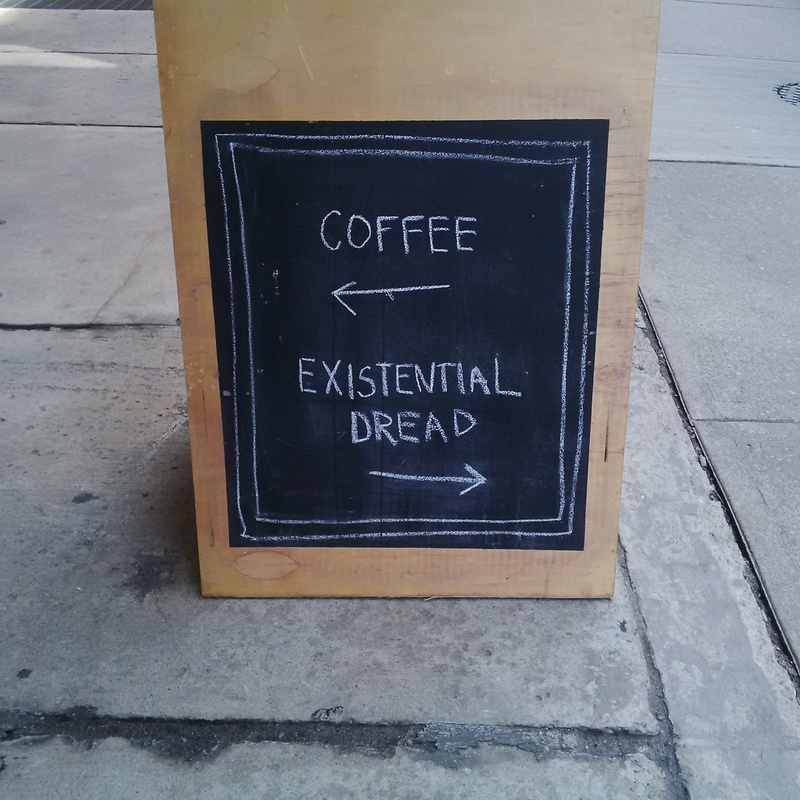 So coffee is the antidote to existential dread. Let’s have another cup. Agreed on the tax season. I helped my two sons and my sister with hers. Thank goodness for Turbo Tax. Let’s have another cup, especially with the rainy day here. That is who I was doing tech work for. Thankfully I was lucky this year… I got the criers, not the screamers! You must be a very patient woman with a soothing demeanor. That is what I glean from what and how you write. I like to think so. I can usually calm people down through their meltdown and then talk them through their software issues. It is only when they utterly refuse to calm down and actually listen that I just roll my eyes and let them rant till they slam down the phone!